Entry-level certification for the career training industry. The Certified Animal Care Worker (CACW) national exam prepares individuals for a career as an Animal Care Working in a variety of settings. Certified Animal Care Workers (CACW) are responsible for caring for the needs of animals. Job tasks vary by position and place of work, but typical responsibilities include; assisting the Vet Techs, feeding, grooming, bathing, and exercising pets. Animal care workers are employed a variety of settings, many work in veterinary clinics, kennels, others work in zoos, stables, animal shelters, pet stores, and aquariums. Achieving the National Career Certification Board’s (NCCB) Certified Animal Care Worker (CACW) designation will demonstrate individuals have mastered the necessary skills to be an effective addition to various types of animal care facilities. While a certification is not required to work as an Animal Care Worker, attaining the National Career Board Certification’s (NCCB) CACW designation will help workers establish their credentials and enhance their skills. The benefits to becoming a Certified Animal Care Worker (CACW) may include more job opportunities, higher wages, and increased job security. Our practice exams consist of 30 questions that are randomly selected from the actual certification exam test bank. The practice exams are broken down into 2 separate exams that can be taken up to 3 times each. This gives you a total of 6 exams to help prepare you for certification. We highly recommend all students take a few practice exams. This helps them to understand the test taking process and prepares them for certification by giving actual certification questions! Scoring a 70% or higher on a practice exam is a good indicator that a student will receive a passing grade on the certification exam. According to the U.S. Bureau of Labor Statistics, overall employment of animal care and service workers is projected to grow by 23% by the year 2020, faster than the average for all occupations. All facilities that house animals, employ animal care workers, therefore employment of Certified Animal Care Workers (CACW) is projected to continuously increase to keep up with the growing demand for animal services. The median annual wage of veterinary assistants and laboratory animal caretakers was $22,040 in May 2010. The median wage is the wage at which half the workers in an occupation earned more than that amount and half earned less. The lowest 10 percent earned less than $16,490, and the top 10 percent earned more than $33,780. NCCB Certification demonstrates that you have achieved the basic level of professional knowledge in your specific field. NCCB Certification gives you a mark of distinction which sets you apart and shows that you have achieved expertise in your field of study. NCCB Certification increases your marketability as it provides external validation of your entry-level knowledge and your abilities in your profession. 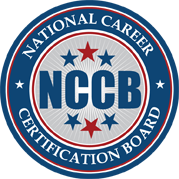 NCCB Certification demonstrates your commitment to your own personal growth and to that of the profession you’ve chosen. These factors can greatly affect your career advancement. NCCB Certification may encourage your employer to underwrite further education for you in the future. By showing them how supporting your professional development is a worthwhile pursuit for the company’s continuous improvement efforts, this could lead to further educational opportunities, a win-win for all parties involved. NCCB certifications are available to everyone that has formal training, work experience or has been self-trained in their field of expertise. Our goal is to be the initial certification organization to validate your education. Purchase a Practice Exam: With each practice exam purchase, you will have access to 2 practice tests that will help you prepare. You may take the practice exams up to 3 times each and there is no time limit. You will have 90 days to take the practice exams. Purchase a Certification Exam: The certification exam will consist of 80 questions and you will have 2 hours to complete it. You will have 30 days from the date of purchase to take the certification exam. ProctorU: Each certification exam is proctored. We partner with an online proctoring service called ProctorU (click for more information @ ProctorU). You will create a free ProctorU account and schedule your exam 3 days in advance. The confirmation email will give you instructions on how to do this. Certificate: Once you have completed the certification exam and scored a 70% or higher you will have immediate access to your Certification Certificate by clicking on the link in the exam center. The certificate will also be emailed to you as a .pdf file. Login Credentials: Once you make an exam purchase you will receive a confirmation email. This email will provide you with login information to the NCCB Exam website. This will not be the same as your login for the NCCB company site. This email will also provide information about ProctorU.